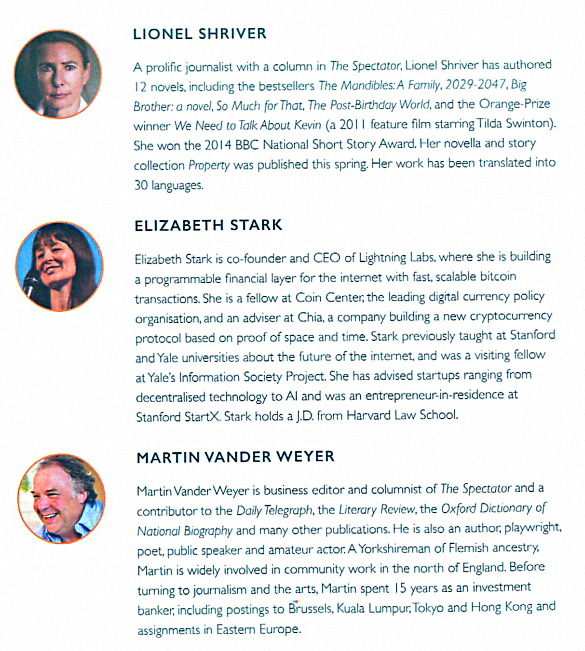 Today’s post is about an event I attended last week – a seminar organised by the Spectator entitled Who’s Afraid of Bitcoin. Before we get into the event itself, let’s recap where we stand on Bitcoin as money. This is where Bitcoin scores best. That might seem a funny thing to say when the price is down 70% from its peak this year, but over the almost ten years of its life, the value of Bitcoin has increased by millions of times. It’s pretty poor for this. It’s slow, expensive to use (around a dollar per transaction) and not widely accepted. It’s terrible at this, too. The volatility is way too high – many times that of a stock index. And the other cryptocurrencies are even worse. That’s why the mainstream world doesn’t take crypto too seriously now that the froth has blown off last year’s bubble. Acceptability is likely to improve, and volatility should fall in the future. But speed and cost are hard to fix without compromising the main advantages of the Bitcoin blockchain – security, transparency and decentralisation. Expect to see “second layer” workaround to these problems (more on these below). It is too early to tell [whether Bitcoin can become money]. There were seven billed speakers, though one didn’t make it in the end. Andrew Neil, presenter of the excellent This Week – one of the best shows on the BBC. Lionel Shriver, the novelist and regular columnist. Martin Van Der Weyer, who writes a weekly business column. Saif Ammous is a professor from the Lebanese American University who has written a book called The Bitcoin Standard (more on that later). 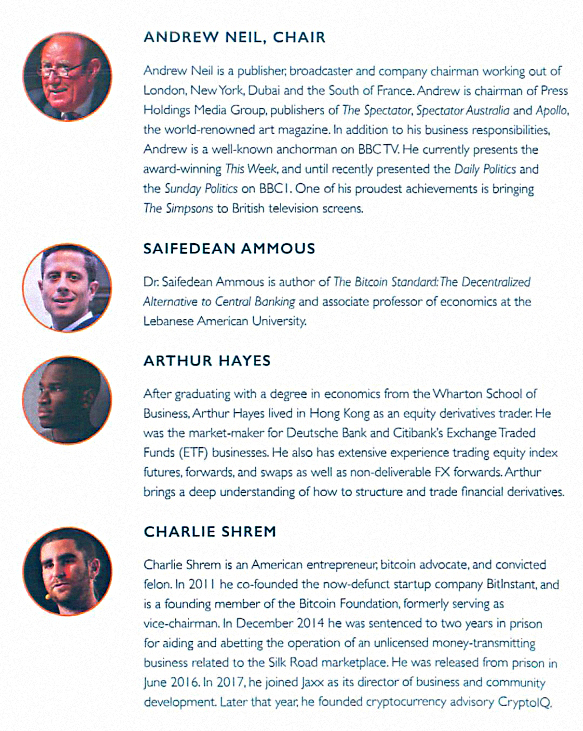 Arthur Hayes is the CEO of BitMex, the Bitcoin Mercantile Exchange who were the main sponsor of the event (more on that later, too). Elizabeth Stark is the CEO of Lightning, a payment system layered on top of Bitcoin (and of course, more on that later). Charlie Shrem was imprisoned in 2014 for activities relating to money-transmission around the Silk Road online marketplace. He was released in 2016. Charlie didn’t make it, as he couldn’t get a visa in time. He was replaced on the final panel by Ben Delo, another co-founder of BitMex. The first session of the day was billed as Who’s Afraid of Bitcoin, but in fact that discussion was deferred until the second session. Instead we got Andrew and Arthur in conversation in what was effectively an ad for BitMEX. We have things pretty easy in the UK. If you want to trade crypto, you just open a spread betting account with IG (other spread betting platforms are available) and they let you bet on eleven crypto markets. Other jurisdictions don’t have it so easy, and that’s where BitMEX come in. Most of their business comes from “North Asia” (China, Japan, Korea). Once you have Bitcoin, you can load it into BitMEX and use it to trade crypto currency contracts. When you want your money back, it gets converted into Bitcoin once again. BitMEX don’t handle fiat currency (other than for their own internal operations) which spares them a lot of regulation. We learned that Arthur “loves the volatility” and that “he owns the racetrack, so he doesn’t bet on the horses”. He was pretty scathing about the non-Bitcoin crypto currencies (though you can trade some on his platform) and in particular about ICOs. Next up was Saif, with the only slide deck of the day, who tried to answer the question for which the seminar was named. I don’t have Saif’s slides from Friday, but I did find some similar slides from a lecture he gave in Munich in May these year. Saif’s basic position is that Bitcoin is good money, or hard money as he sometimes calls it. He foresees Bitcoin becoming first an excellent store of value, then as adoption progresses, a unit of account, and (via second layer technologies – he calls these off-chain transactions) a medium of exchange. This means that if people see a difference between two forms of payment, they will use the worse one and hoard the best one. Local currency versus the dollar in a failed state like Venezuela would be a current example. Venezuelans hoard dollars because they know they will preserve value better than the rapidly-depreciating bolivar. Good money is generally something that is hardest to produce in the local market. 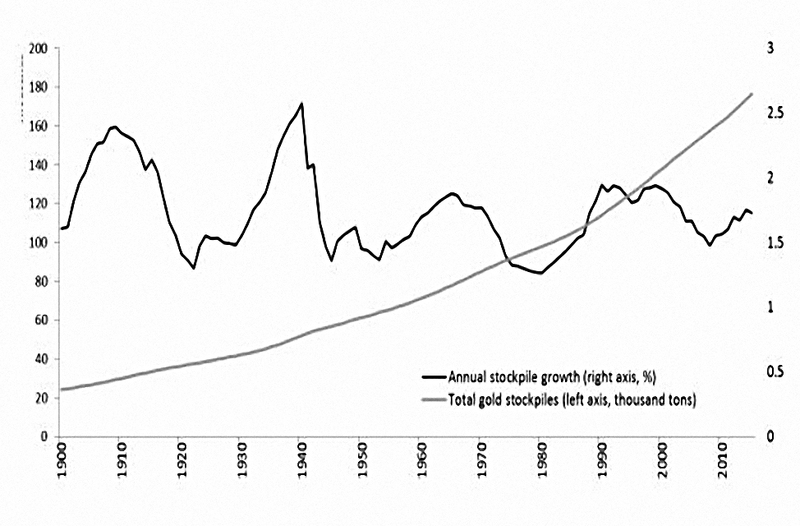 Many things have been used as money, but in the nineteenth century most countries converged on gold. Then in the twentieth century everyone abandoned gold and switched to fiat money, which is based only on the promise of the government to behave well (not produce more money). 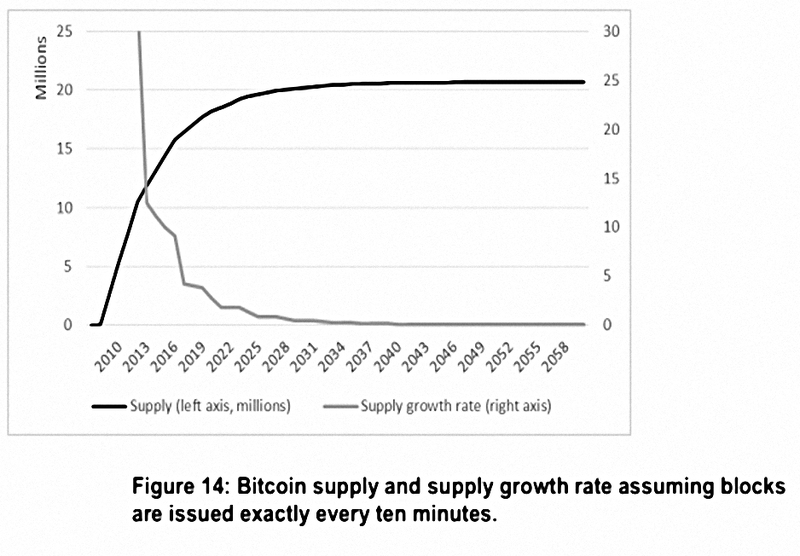 Bitcoin is very hard to produce, and even harder to undermine. 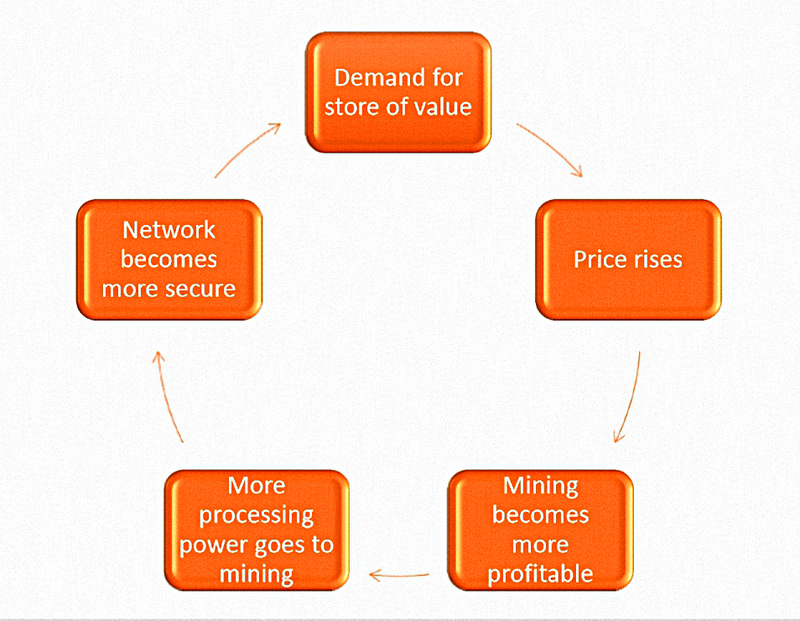 Because of the scale of the computing power (“hashpower”) involved in the continuously-verifying network. And because of the natural limitation of 21M coins. So Bitcoin is a good candidate for sound money. So only things that are hard to make can succeed as money in the long term. We can argue about “hard to make” – strictly, only governments can issue fiat, but they can create as much as they like, and banks create money when they make loans – and “long term”, but the basic principles are reasonable. Saif showed that that gold stockpiles increased by only 2% pa since 1900, whereas fiat money has increased by 32% pa since 1960. Saif’s big point about Bitcoin is that when it’s value goes up, it is not possible to increase production. In fact, production gets harder instead. And the extra processing power added to the network increases its security. Bitcoin is hard to confiscate. It will undermine government money printing and financing through inflation (devaluing the debt). Easy money (fiat money) is expected to lose value over time, and encourages spending (consumerism) and short-term thinking. 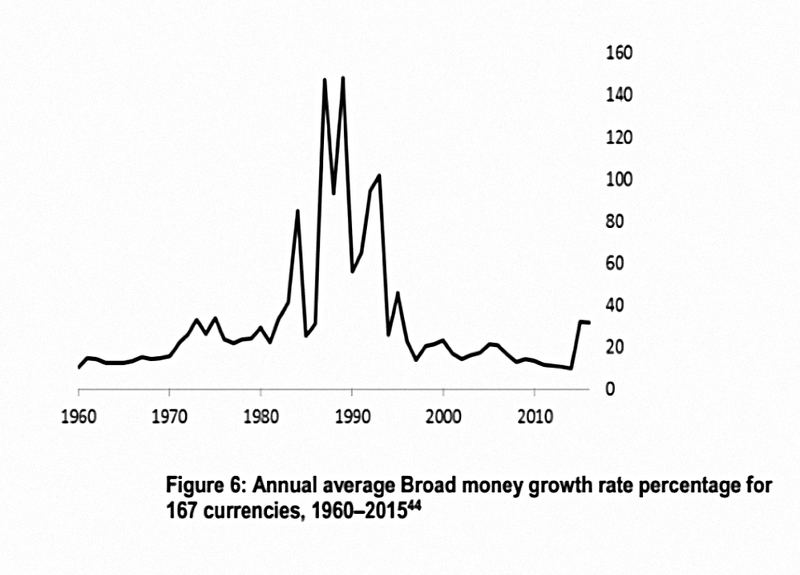 Hard money will encourage long-termism, capital accumulation and productive investment. Saif says that this low time preference is what “initiates the process of civilisation”. Saif was dismissive of other coins – they lack the organic first-mover advantage of Bitcoin. And attempt to make one alt-coin stand out over all the rest smacks of marketing by a controlling group. The absence of such marketing – and such a group – is one of Bitcoin’s key advantages. He was even more scathing bout ICOs. The weakest part of Saif’s presentation was a brief discussion of art. He flashed up a slide with the Sistine Chapel and what looked like a Rothko side by side. He said the first was produced with hard money and the second with easy money. The first is good and the second is bad. The first could not be reproduced by any human alive, and the second could be painted by a child. I guess it’s hard combining Austrian economics with art criticism. I’ve seen the Sistine Chapel, and it’s not that great. I’ve seen a lot of Rothkos and they are tremendous. Art is not craft – it’s not the time or even the skill involved, it’s the emotion the art evokes in the viewer / reader etc. Otherwise a long piece of doggerel could be “better” than a Shakespeare sonnet. And Mozart might be better than Bach. Michelangelo was making what the Pope wanted, and Rothko was making what he wanted. Saif should have compared a Rembrandt self-portrait with a Jeff Koons, or a video installation. Then I might have bought his argument. I’m forced to conclude that Saif doesn’t know much about art, but he knows what he likes. Fortunately he knows a lot about money, and about Bitcoin. That was it for Saif, but Martin gave a very funny rebuttal, stating that Bitcoin was just the latest in a list of “revolutionary” financial cults. He sees Bitcoin as a medium for speculation, already replaced by sexier alt-coins, IPOs (and – I would add – cannabis stocks). Lionel described her research process for a recent novel which involves a Russian / Chinese alternative currency. She seemed quite annoyed about the debasement of sterling and the dollar, but not entirely convinced that Bitcoin was kosher. Elizabeth gave a pitch for Lightning, and off-chain (second layer) method of speeding up transactions. She seemed to think that making transactions from your phone more immediate was one of the world’s burning issues. I know I’m biased, but this kind of talk makes millennials sound like they want the moon on a stick. It’s never been easier, quicker or safer to send money to people far away, or to strangers. Significant further improvements are really not a priority. Lightning sounded like a good idea to me, but I’m not sure how you would get normies (like me) to trust a new network more than Visa, or even PayPal. The seminar ended with a panel discussion involving all seven speakers. Once again this was very entertaining and I could have happily listened for another hour. Once question that came up (I can’t remember in which session) was Bitcoin’s ever-growing energy use (currently on a par with Austria). The Bitcoin types made much of the use of marginal geothermal electricity, and stressed that a secure money transfer system was a top priority for the planet. In a sense he’s right, but in general, the more energy we use, the hotter the planet gets, so there are limits. We aren’t at frictionless renewable energy just yet. At the start and the end of the seminar, we were asked whether we would prefer to receive a £50 note, or £50 of Bitcoin. Given Bitcoin’s costs, volatility and narrow acceptability, a £50 note that I could spend that afternoon was clearly preferable. If I thought that Bitcoin had great prospects, I would have already allocated some assets to it. At the start of the morning the audience (young and techie for a Spectator event) was split 50:50. By the end, it was 90:10 in favour of Bitcoin. The interesting thing for me is how easy it was to shift so many people’s viewpoints. It was a rally entertaining and informative seminar, at a good location with excellent catering. I would gladly attend something similar in the future. The highlight was Saif’s presentation, which drew a seemingly outlandish conclusion from a fairly reasonable set of assumptions. I’m still agnostic about Bitcoin, but probably more optimistic in the long-term than I was before the seminar. I still struggle to see how we get from where we are today to Saif’s sunlit uplands. For most people, a safe haven means the dollar, US bonds, gold or the Swiss Franc. But perhaps that’s a generational thing. I also have reservations about whether advances in computing power (quantum computing, or the use of light) could disrupt the hashpower advantages of Bitcoin. But perhaps that’s a self-regulating thing (more power would be drawn to the Bitcoin network). Minor quibbles, but we’re still looking for that catalyst. 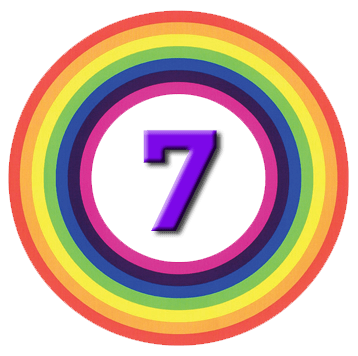 7 Circles > Passive & Assets > Assets > Who’s Afraid of Bitcoin?